I’m grateful for a straight historical and for a fascinating and educational drama, but ouch, this one’s brutal. 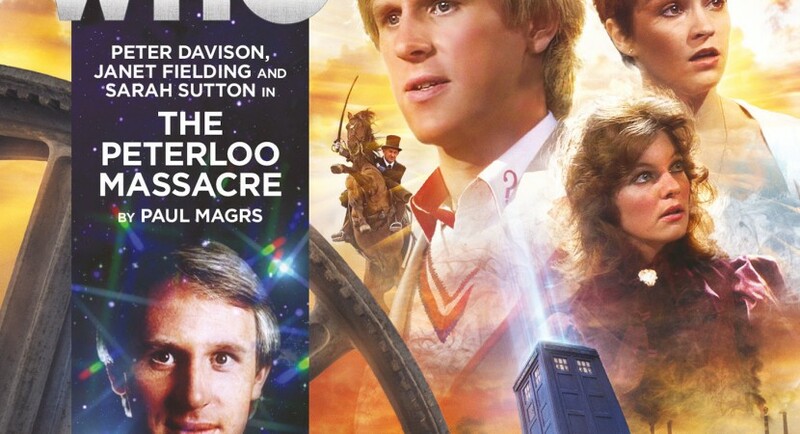 The Doctor, Nyssa and Tegan crash land in Manchester, thanks to a minor plot contrivance. They are soon swept up in the tragic events of 1819 Manchester, through their involvement with a wealthy factory owner’s family and some of their poor employees and servants. The Doctor, Nyssa and Tegan face courageous and dangerous moments of confrontation as they try desperately to make a difference somewhere. Actors Peter, Janet and Sarah rise to the occasion, giving their all to powerful speeches and emotional scenes. Once again, good guest characters help us and the TARDIS crew to become emotionally invested in their lives and larger unfolding events. The Hurleys, kitchen maid Cathy Roberts and reporter Thomas Tyler provide human faces to the struggle. Doctor: You call this victory? Hurley: Are you threatening me, sir? Nyssa: He isn’t. But I might! As Janet Fielding notes in the audio extras, this story is valuable for introducing many of us to the real Peterloo Massacre, a watershed moment in world history, a pivotal moment for the labour movement, democracy and women’s suffrage. It’s just the sort of thing one doesn’t learn about in school, at least in the States. I’ve learned so much world history and archaeology by chasing down references in Doctor Who, from The Time Monster to The Church and the Crown. (Not that I should mention The Time Monster in the same breath with well-researched historicals). For the most part, it’s a well-written script, as one would expect from one of the classic writers of EU Who, but there are a few puzzling elements. First, there’s some early, misleading clues that turn out in the end to be red herrings. In one case, the truth behind the misdirection conceals something which is absolutely vital to understanding the audio, assuming I read it correctly. Also, as author Paul Magrs noted, this is a story like some of the first Doctor era in which the drama is largely that the TARDIS crew is trapped in the wheels of history, and they may have little or no ability to avert what’s coming. This particular TARDIS crew often wrestles with fixed points in time, since they’d faced greater loss than any TARDIS team since Steven, Katarina and Sara Kingdom. They grapple with the problem again here. But for the most part, it’s almost purely a character story, showing how the TARDIS crew and guest characters cope with events. It’s good drama, and I appreciate that this cast of thirty years ago has still not exhausted new possibilities and character development denied them on TV. However, like Spare Parts and some of Big Finish’s other finer stories, it’s not exactly fun. So I’m waffling between giving it an 8 for quality of story vs. 7 because it’s so grim that I probably wouldn’t listen to it again if I didn’t favour this TARDIS team. About that minor plot contrivance: after all the TARDIS’ trips back and forth through Earth history, shouldn’t it have shorted out from the “carboniferous emissions” of the Industrial Revolution before now? Here’s the two red herrings I alluded to earlier. First, Tegan is afraid of becoming her own great-great grandmother by mistake. It’s a bit of a running joke with Tegan’s character that we kept running into her friends and family— her aunt, her grandfather, a boyfriend or two— so I suppose Paul Magrs was trying to avoid compounding extraordinary coincidences. But I was so sure that outspoken, talking-truth-to-power Cathy was going to turn out to be Tegan’s great-great grandmother! I fully expected her to be deported to Australia at the end of the audio. After all, Janet Fielding’s real great-great grandmother (I think?) was deported for nothing more than stealing a goose. The other and more important red herring is the misdirection about the identity of Peter’s father. It’s important to give Nyssa, Tegan and the Doctor a motive for galloping back to Hurley Hall and intervening in the confrontation between William and his father. But they’re wrong about William being the baby’s father, which is one hiss of air being let out of the drama balloon. Another is that William keeps saying it’s time to come clean with his father, and it’s not 100% clear what account he’s settling with Dad, what truth he wants to come out, or even whether he really meant to kill his father or whether that was just Tegan’s ongoing misunderstanding of him. (I think he was trying to force his father to admit whose blood was on his sword— Cathy’s— but it wasn’t entirely clear). Mr. Hurley says the boy’s father was probably some rabblerouser, but agrees that regardless, Peter and Cathy were part of their household. So he’s learned his lesson, and there’s hopeful hints he may take the Doctor’s chiding to heart and improve factory conditions. But… I think… the unspoken truth in this story is that Mr. Hurley is the boy’s father, something he certainly won’t admit. His entire manner changes not when Nyssa confronts him about Cathy, but when he learns the baby is dead. That’s what seems to shatter and fundamentally change his outlook. If I’m reading it correctly, there’s a telling exchange between him and Mrs. Hurley when he returns home. She fears something horrible has happened to their son William. Mr. Hurley replies, “Not to him, not to us. Our world hasn’t changed.” And he is very careful to call Peter “the child” and “the baby,” never Cathy’s brother— he knew all along the child was hers, and almost certainly paid for her to go away to have the child born. I think Mr. Hurley realized that William, his legitimate, received-everything-on-a-platter son born into wealth and power had enjoyed one fate (unscathed), whereas his poor, unacknowledged son, born into humble circumstances not so different from Mr. Hurley’s own childhood had died, an innocent victim of circumstances and oppression. The fact that Mr. Hurley won’t openly acknowledge this truth in public or to his family is most definitely in character. But I wish it could have been clarified somehow— perhaps in an oblique aside to the Doctor, if Hurley could’ve bent his pride enough, or perhaps via some comment of Cathy’s. If that had been a little more clear, I’d rate this audio a 9.